Today was a work day. At one house I was checking, the owner told me to watch out for bears. I chuckled a bit. He said, "Really! We had a big one come through the back yard this morning and take down the bird feeder." 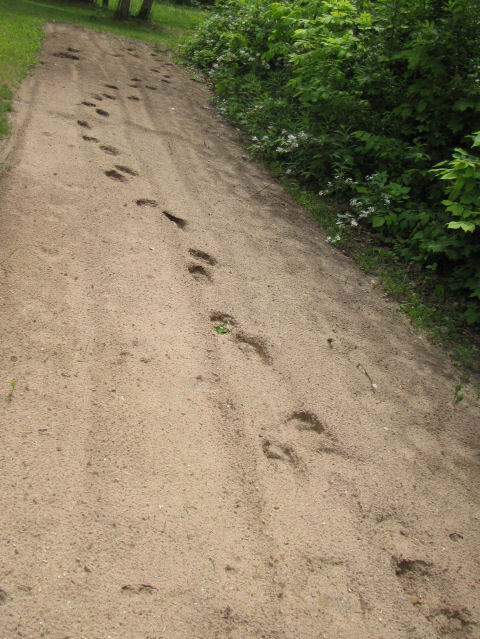 He was not kidding, and the bear left a nice set of prints through this prepared garden dirt. 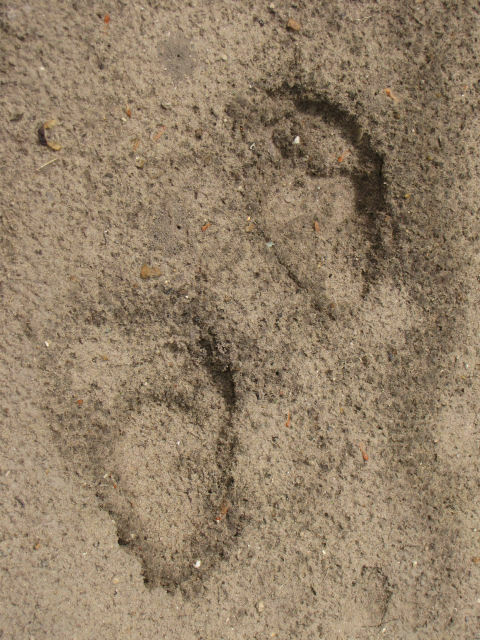 The dirt was so soft, the impressions aren't too distinct, but the pattern of the tracks is fantastic. 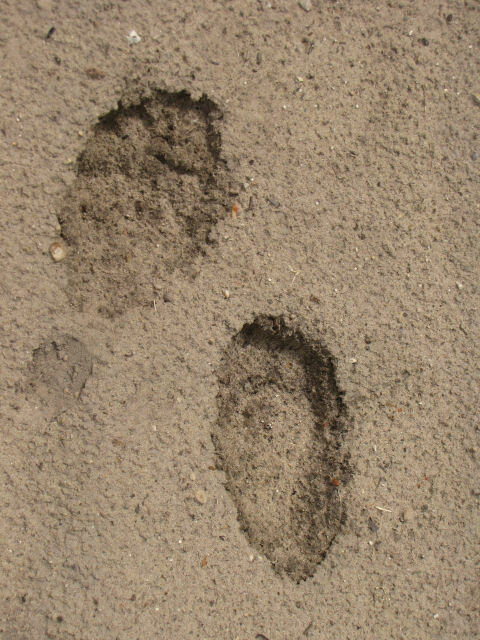 The toes don't really show, but you can easily see the general shape. This set shows how they sometimes get "pigeon toed." The man also said, "If that bear comes for you, you run in the house quick. I'll watch you till you're finished." But all I saw was the tracks. I promised you some more fun from my New York trip, and here's a sample. This is a Common Grackle, Quiscalus quiscula. It's a largish bird, about the size of a blue jay. They don't have a pretty song, but I like them anyway, because of their iridescent heads. This one was exceptionally happy. I took this the same day as the post linked below. Tomorrow... work assignments. Wonder what I'll find? 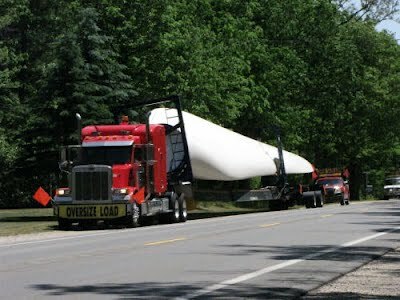 Wind Power on the Way! I live in a windy place. 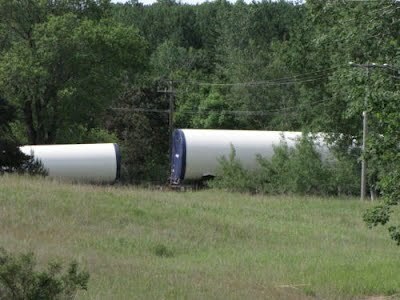 For several years now, companies have been trying to locate wind turbines here. 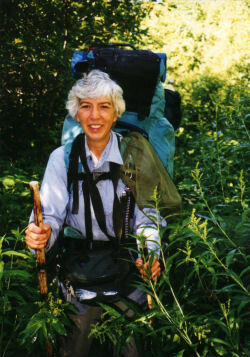 First they wanted to put them in the Manistee National Forest where they would be visible from Nordhouse Dunes, the only wilderness in the lower peninsula. Nope. 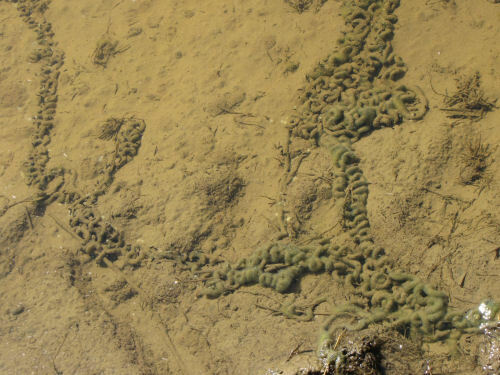 Next they had the idea to put them offshore in Lake Michigan. Nope. 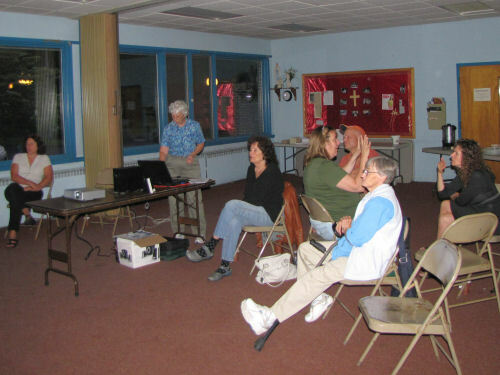 The final result was they got some individuals to lease them the land. That works just fine for me. I think they are rather majestic, but I wasn't a fan of putting them in the forest or the lake. The tower bodies are coming in sections by rail. Here are some going by my house. 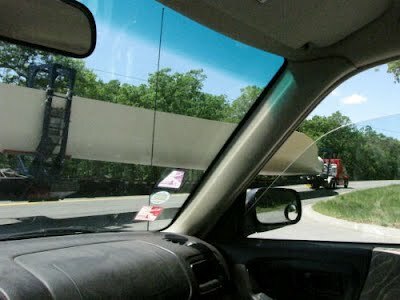 There have been billboards warning drivers to watch out for trucks carrying the blades. I'd seen some in North Dakota, but somehow there's more space there. Today, when I encountered three of the blades it was pretty darn impressive. One truck can bring one blade. No wonder the blades don't come by rail. They are too long for train cars. It's hard to tell the length even so. The trucks are at least twice as long as regular ones, and have to have escorts, of course. This pic, of one going by my car gives a slightly better sense of their size. One friend on FB is doing a really good job of chronicling this whole process because one is going in near his house. My attempts are haphazard, but I'm glad I got a picture of the blades. 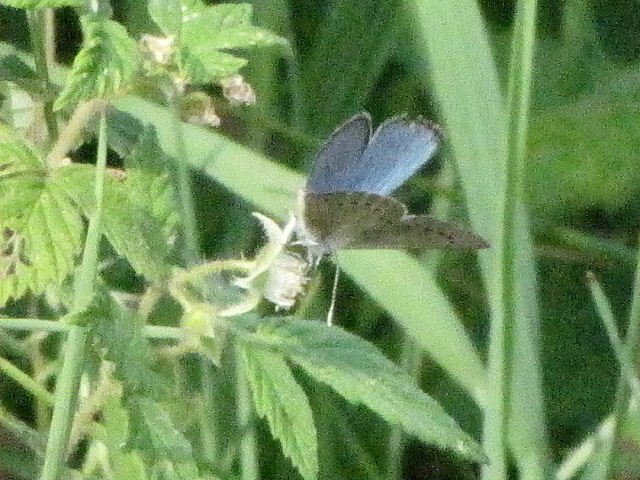 These aren't great photos, but they are better than others I've gotten to date of this little blue charmer. The mysteries of little blue butterflies are great, and they are nervous flutterers. However, I learned something really important today. They are easiest to tell apart by the drab undersides of their wings, and when they land, they fold up and show those undersides. Of course, the blue is prettier, but it's nice that they make it more convenient for identification, once one learns all those patterns of spots. 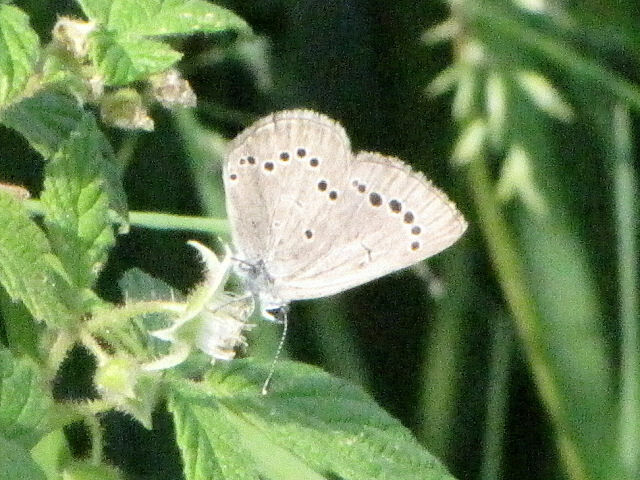 So, for sure, this is Glaucopsyche lygdamus, the Appalachian Silvery Blue. It's very common. That's OK. Maybe I'll get so I can ID it easily. Remember, this butterfly is about half an inch across. This one is male, because it has dark bands on the edges of the top sides, which I just managed to catch in one shot. Hot and humid here. I worked all day at writing things, and have to do assignments all day tomorrow. Just a quickie laugh. Do you think I'll ever get caught up enough to read blogs? 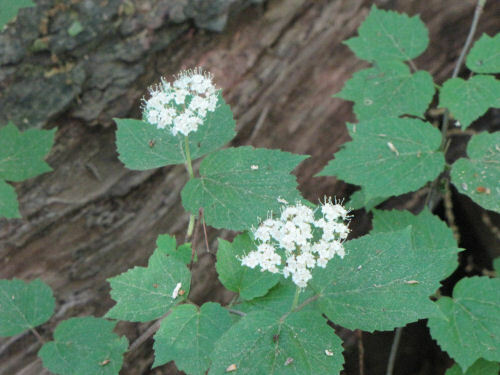 Viburnums are shrubs. There are over 150 species, worldwide. Some are tropical and evergreen, but many are temperate and deciduous. Yesterday, I showed you the blooms of the Maple-leaved Viburnum, Viburnum acerifolium. 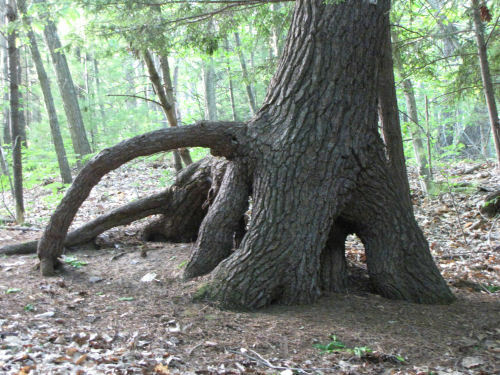 It's usually a small shrub. 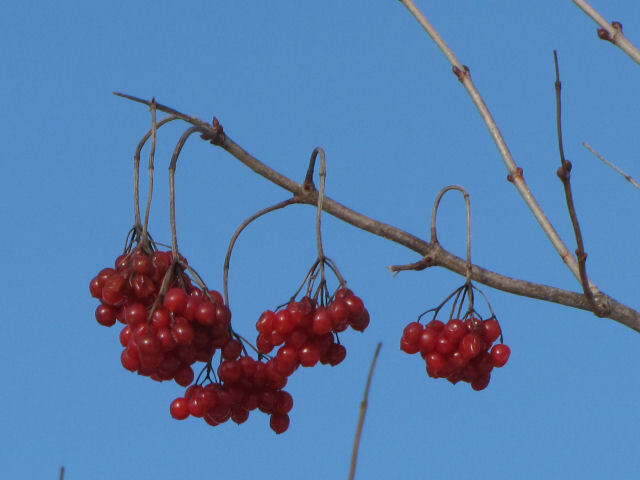 On the other hand, the highbush cranberry is more like a small many-stemmed tree. OK... remember these problems with common names. This isn't a cranberry at all. It's just that the fruits are red and tart, so they got that nickname. I've showed you the fruits before. 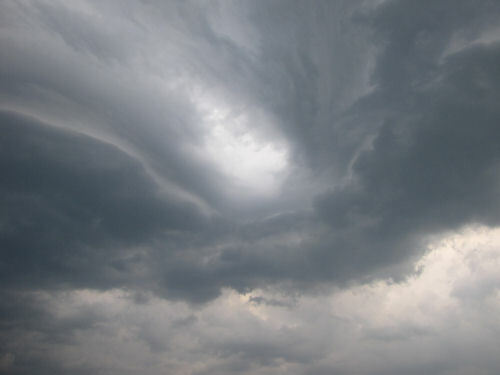 This is a picture from February 2010. Then, there's another issue. 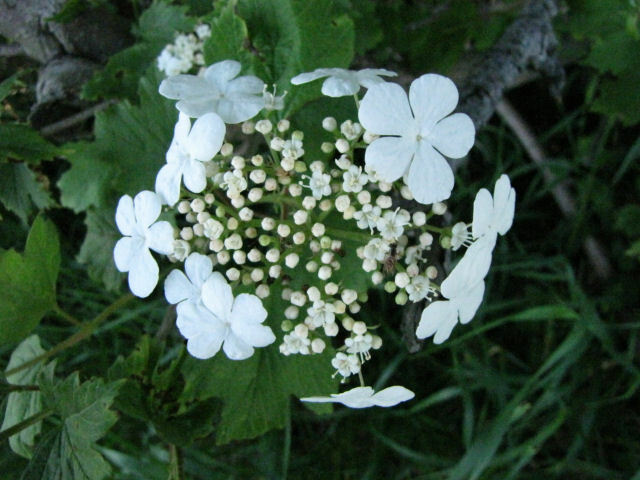 The North American native shrub is Viburnum trilobum. The Old World variety is Viburnum opulus, or is it? The problem is that the two are nearly indistinguishable, but some people claim that the berries of the North American variety taste good, and the others don't. And then... the European ones were brought here and planted, so they got mixed up too. The ones I see here were almost certainly planted as ornamentals, but I can't really tell that they taste bad. I haven't been motivated enough to pick a bunch and make something. I should, though, because that would be a real test of the taste. Not like just eating one berry. 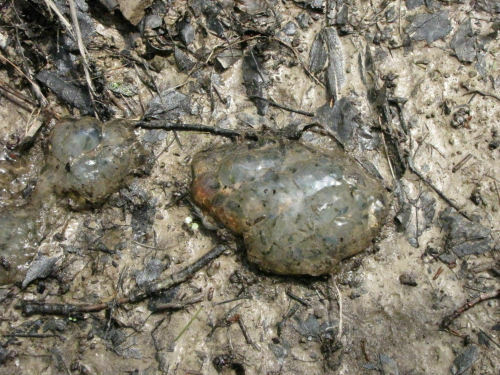 Some taxonomists now say that trilobum is only a variety of opulus. At any rate, they have beautiful flower corymb. Isn't that a great word? 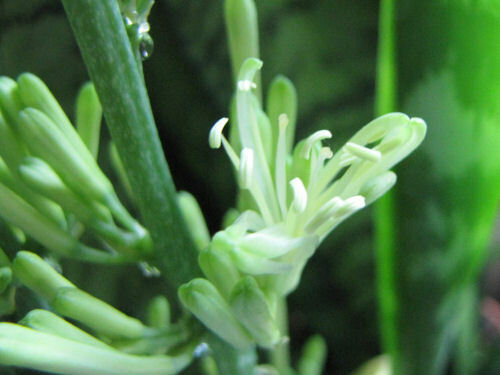 It's a loose, branched head of flowers with the lower stems growing longer so that the head is flattish. And the corymb has a secret. Those lovely outer flowers are sterile. They are just for show, to draw in insects for pollination. The real flowers are those little guys in the middle. Only a few are open yet in the picture. 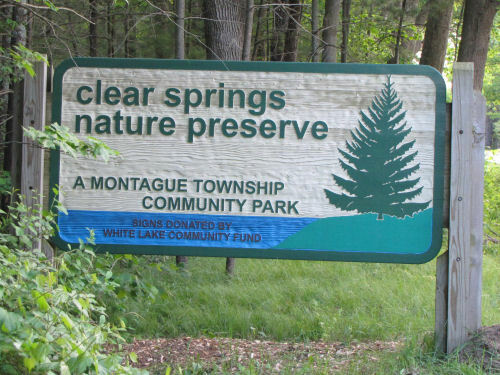 I had work assignments that kept me busy till after 6:30, but I had seen an entrance to the Clear Springs Nature Preserve on Wednesday, and wanted to check it out. 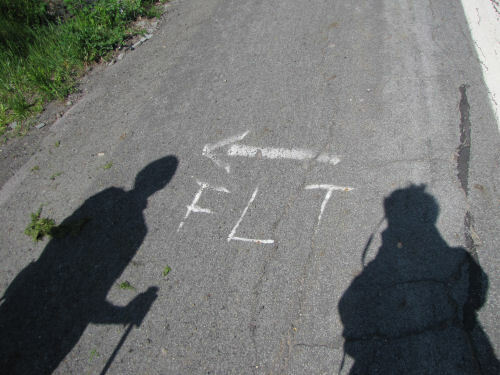 There was a map posted of the trails, but no way to figure out how long any of them might be. I took a chance on the longest, and ended up walking about two miles round trip back to the car. Along the pond there was certain evidence of beaver activity, although I didn't see any lodges or natural dams. 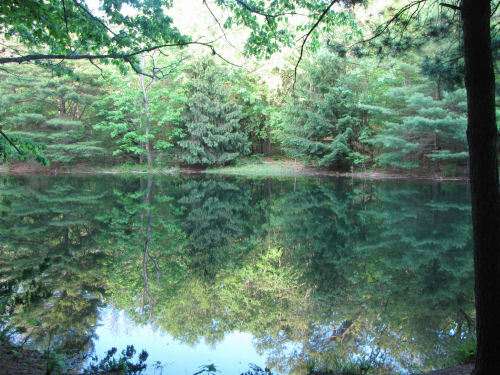 There are two ponds and an old fish hatchery area. Today there was a lot of pollen floating on the water. It wasn't too attractive, but the reflections were nice. The maple-leaved viburnum is in full bloom. And finally, if one of you is missing your pet anteater, I know where it is. This week is turning out to be crazy busy. I got a ton of work assignments, most of them a long distance away. I'm really happy to have the work after two weeks with no income, but I'm definitely chasing my tail. 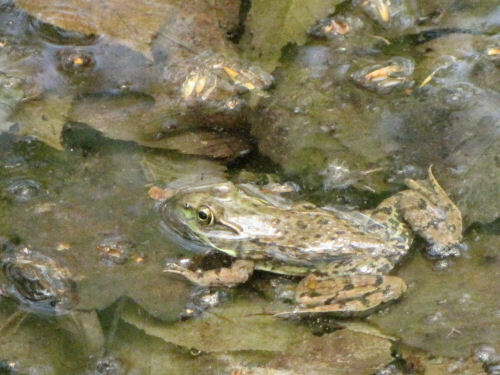 I'll just post another picture from the Esopus Creek Nature Preserve in New York. 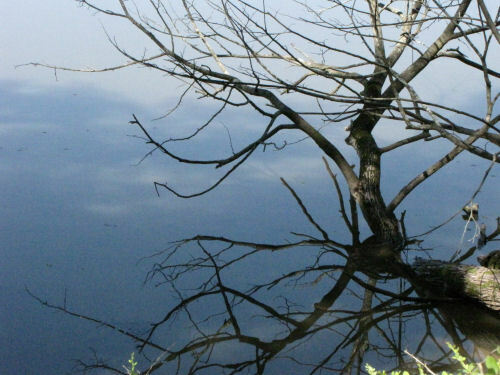 This is a tree and its reflection, but I find it fascinating because it doesn't really look like a reflection. It must be a trick of the angle of the tree as compared to the water surface. Tomorrow, I'll be out all day again on assignments. I do hope to visit one interesting place that I discovered yesterday, so there might be some pictures to share from that! This is one of the most common damselflies, but who wouldn't like its bright body and lovely name? This is a boy. The girls don't have shiny blue-green bodies, but they do have a white spot on the wing. You can tell damselflies from dragonflies because the damselflies rest with their wings along their bodies like this one. Dragonfly wings are always at right angles to their bodies. However, they are both in the order Odonata. 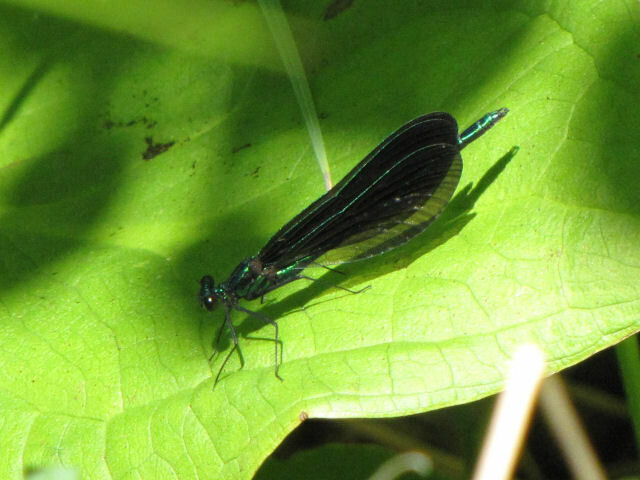 The ebony jewelwing is Calopteryx maculata. Lots of work this week. Trying to get caught up! 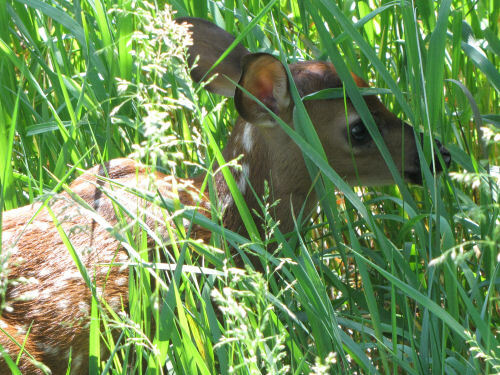 Yes, I know it will soon be eating my plants, but the whitetail deer is very cute at this stage. Fortunately, Maggie never saw it, so I managed to catch her collar to prevent any chasing episodes. I think this one is a day or so old, but it is only about 18 inches tall. The closeup is a separate picture, not just a blow-up of the first one. 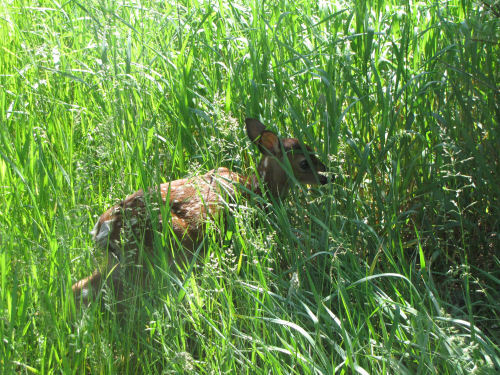 I point that out only because the fawn hasn't moved an inch or twitched an ear or anything. When Maggie got within about ten feet it finally moved, raising its tail and bounding away on unsteady legs. The does teach them to hold very still, and only move if forced to. The spots really camouflage them well. 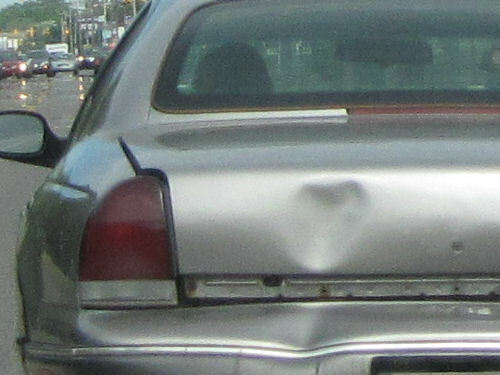 I was only about ten feet away when I finally saw it. And the newborns have no scent, so they don't attract predators. There are SO many cool things from the past two weeks to share, I'll probably throw them in on days when not much has happened here. Wait, what am I saying? I rolled out of bed, caught up on some email, paid bills, made a shopping list, met someone to check out a place where I'm leading a botany walk on Thursday, came home and took a poison ivy shower (! ), went grocery shopping, took care of all the stuff, cooked a soup for my dinners this week, walked the dog twice, printed out work tickets for my "real" job, and then settled in to read a few blogs, start a plant checklist for Thursday, and blah, blah, blah. Stuff happened here, but I'm just going to show you this anyway. So there. 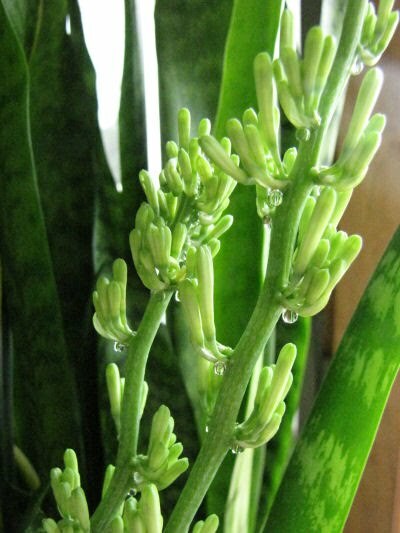 This is an ordinary Mother-in-law's Tongue, Snake Plant, or whatever you like to call it. 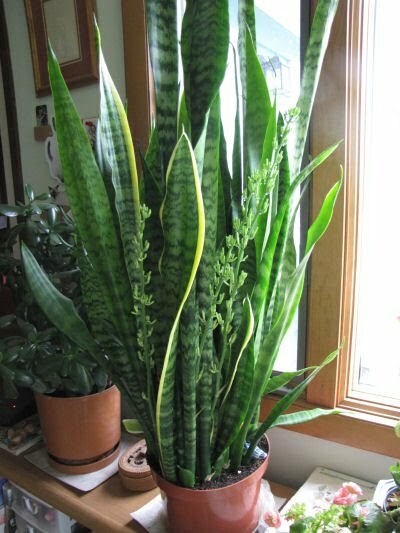 It's Sansevieria trifasciata, a native of western Africa. Most anyone with houseplants has one. However, Marie's decided to bloom this year, which is rather rare. Her plant is really rootbound, and with some succulents, like "hens and chicks" that is almost a prerequisite for blooming. Hers has about five of these stalks, all of them exuding those droplets, which are sticky. 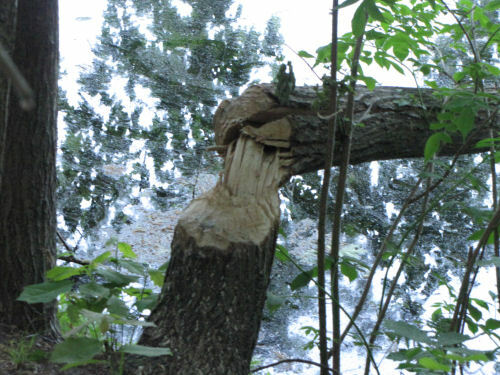 It's just sap, and many plants will produce the drops if there is high root pressure. The drops are just water and plant sugars. One of the blossoms was starting to open before I left. I think it will open farther and the stamens lengthen until it looks almost like a starburst. Hopefully, Marie will take more pictures. I have a chunk taken from the same plant. I wonder if mine will bloom one of these days. Yup, I made it home just as it began to rain! The 797-mile drive took almost exactly 14 hours. I was stiff, hot, and bored, but it was all uneventful, which is a very good thing to be able to say about a long drive. Apparently the 100-degree heat turned my brain to mush. I often get some good thinking done in the car, but today I just vegged out and let the green scenery stream past with no memorable thought processes occurring. About 5 miles from home I began seeing lightning, and stopped to take a picture of these awesome storm clouds. 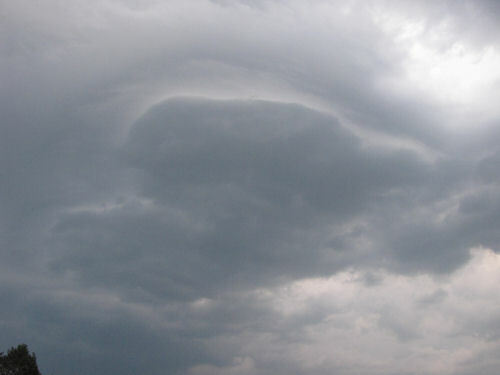 I think the second picture is what's called a shelf cloud. My trip was totally awesome, and now I have to buckle down and begin to get caught up with all the things I've ignored, including you, by blogging friends! I have to leave here early tomorrow morning because I now HAVE to drive all the way home tomorrow. It's about 14 hours. 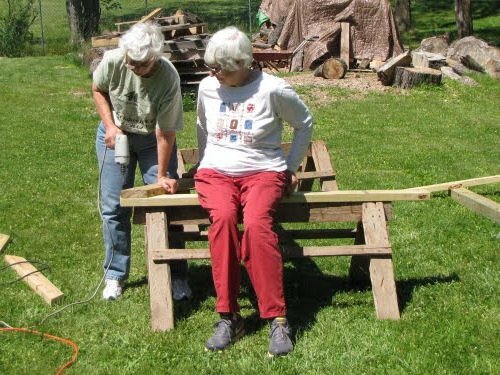 This morning we got the clothesline poles put together, and Marie's husband is going to dig out the old cement plugs where the old poles rusted off, and put the poles in the ground. Here we are securing the braces. 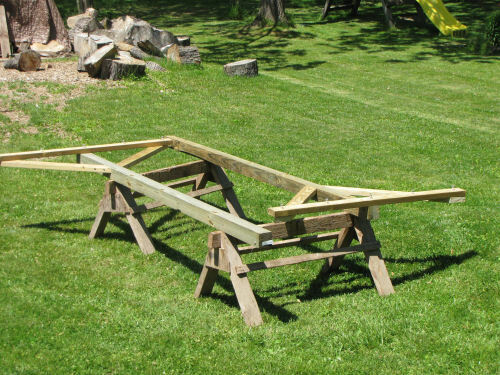 And here they are, completed, but just resting on the sawhorses. 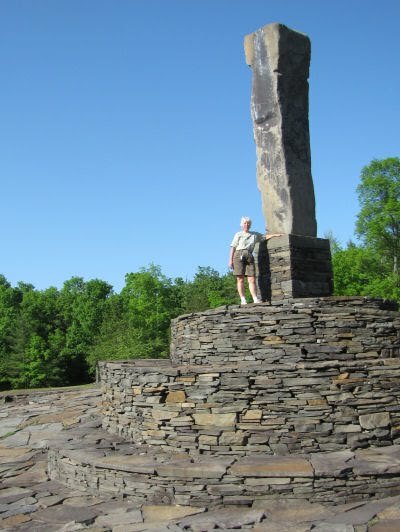 In the afternoon we went to a place called Opus 40. 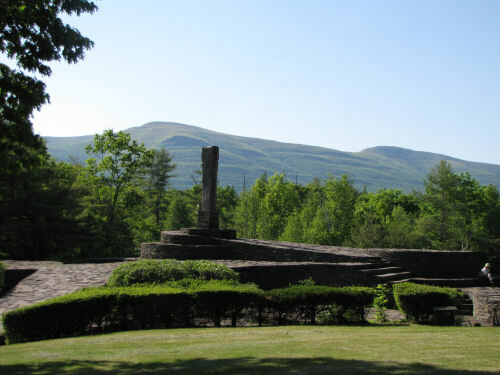 It was built by one man over the course of almost 40 years on the site of an old bluestone rock quarry. It is a huge open area on multiple levels with a theme of concentric and overlapping circles. It's all dry-stone construction so there is no problem with frost heave. They even use it as a stage for concerts sometimes in the summer. Now I have to try to get to sleep. I should be home the next time you hear from me. Our last day of hiking was Sunday, and we only had 6.7 miles to walk. I had planned a little longer, but parking the car at the place I had chosen to end was not very good, and it was a really hilly day, so we settled for the shorter distance. Pictures like the first one are always fun. 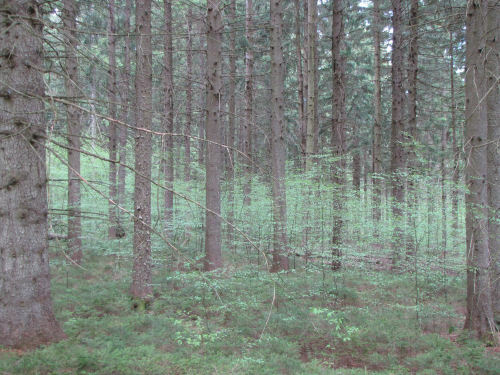 We just thought the understory beneath these pines was frothy and pretty. Finally, just a cutie for Lin! Today, we shopped for lumber and hardware for new clothesline poles, and after lunch went for a little hike at Esopus Nature Preserve. 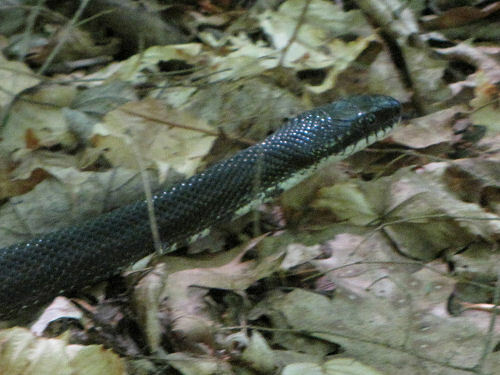 We saw two lovely rat snakes (completely harmless). I'm tired. See you tomorrow! 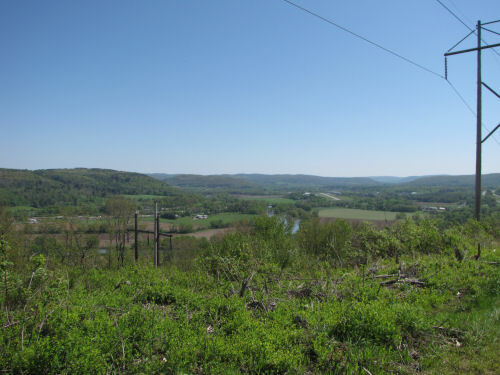 On our fourth day out we walked 9.6 miles, and early in the day we climbed 280 feet to the top of a hill in a power line cut and were rewarded with this great view of the Susquehanna River Valley. It was extra awesome, because most of the way down the hill we had the same view, but could see it at slightly different angles. Quite a bit of this day's hiking was on roads. They were back roads, so none of it was unpleasant. The weather was warm and we finished quite early in the day, so we treated ourselves to ice cream, and bought dinner to go. We got a "Hopped-up Dagwood" at Hoppie's. It was like a Reuben on top of a grilled chicken with pesto. 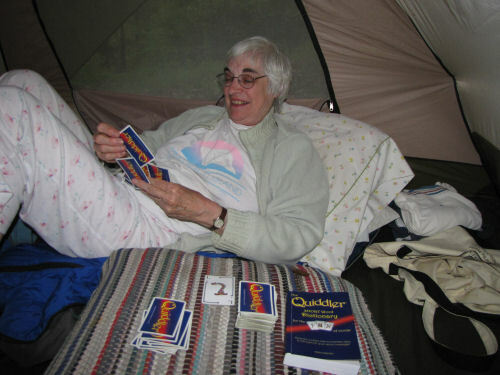 We took it back to the campsite, so we could play Quiddler, and split the sandwich when we got hungry. You have to understand; we are like two obsessed people about this game. We don't seem to ever tire of playing it!